5. The English entries must be attached to an e-mail sent to heights.english@gmail.com with the subject head KUWENTONG PAMBATA on or before September 30, 2012. 6. 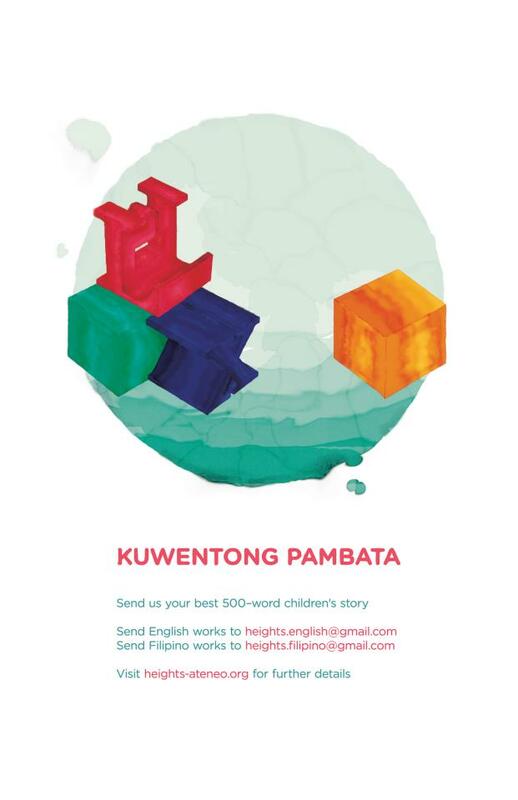 The Filipino entries must be attached to an e-mail sent to heights.filipino@gmail.com with the subject head KUWENTONG PAMBATA on or before September 30, 2012. 7. Any lack of required information means failure of submission and the work will not be deliberated. 8. One (1) entry for both English and Filipino will be selected as finalists. 9. Between the two chosen finalists, only one (1) winning entry will be chosen for publication as the KUWENTONG PAMBATA 2012. The said entry will be published as a children’s book, with illustrations and layout by the Art and Design staff of Heights. 10. For further inquiries, please contact us at art.heights@gmail.com with the subject head KUWENTONG PAMBATA.